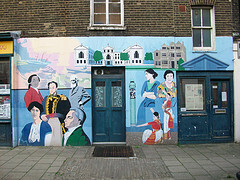 Fitzrovia Play Association Mural by Brian Barnes MBE and local children (2000). Fitzrovia is not what you might expect. Despite reports to the contrary there continues to be an inclusive artistic tradition here. It’s hardly surprising that an infamous Guardian article suggesting the Vyner Street art scene was dying annoyed many in the East End. But it also annoyed many of us living in Fitzrovia, which still clings on as a place where many ordinary people still live. Something that is often forgotten is that our neighbourhood does have a large amount of social housing as well as a dwindling number of cheaper, privately-rented flats. Around 70 percent of people who live in Fitzrovia rent their homes, and the housing advice service run at our advice centre remains busy with enquiries and we do our best to support people against rising rents. But why does the author of the article in The Hackney Citizen point the finger at Fitzrovia and say its name “already sounds like an exclusive destination”? That’s not a Fitzrovia we recognise, nor what many people who have lived here most of their lives, nor the many people from all over the world who work here. Although the name Fitzrovia was coined in the 1930s and further popularised in the 1940s by Julian-Maclaren Ross it fell out of use in the post-war period and into the 1960s. For more than a decade the name Fitzrovia was not commonly used. But it was taken up again by a group of people in 1973 who were fighting against the commercialisation of the neighbourhood. The Fitzrovia Festival of that year was to remind the powers that be the “The people live here”. It was a call to halt the loss of housing. One of the questions many people living in Fitzrovia ask is: why are there so many galleries, yet so few artists? It is of course a rhetorical question because we know the answer. There was a time when many artists did live here, when the area was a great deal more affordable than what it is today. Even 20 years ago students could easily find a flat to share here that was surprisingly affordable. Shabby Fitzrovia meant it was cheap. And there was a great deal of squatting before that. 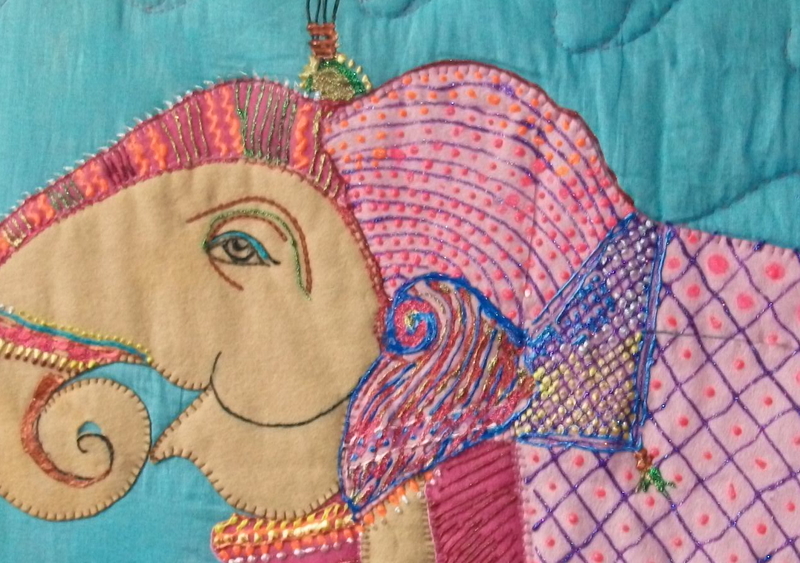 Embroidered Bengal elephant created by Bangladeshi women in Fitzrovia. However, there continues to be a creative tradition here but that tradition has been marginalised. Our exhibition to coincide with Fitzrovia Lates demonstrates that by highlighting the art by people actually living here. We have photographers, textile creators and and we have a tradition of political activity and what could be described as “positive graffiti”. There is also the established community art group Fitzrovia Noir. But Fitzrovia is changing, and not for the better. Most people here don’t welcome the gentrification of the area any more than the ordinary people in the East End do. Who does welcome the increasing cost of renting? Those that buy-to-let and the existing landlords, for sure. People living all over inner London have a lot in common and most of us see beneath the hype portrayed by the media when describing passing phenomena. Fitzrovia has its share of misrepresentation by the mainstream media and it’s a shame to see The Hackney Citizen doing the same. The author of the article would do well to visit our Neighbourhood Centre which has been at Tottenham Street for nearly 40 years and providing housing, welfare advice and more; and which now doubles as an art gallery on the last Thursday of the month. You can wander the streets and see for yourself that mostly Fitzrovia is not what it is portrayed as. We are no different to people all over inner London who continue the fight for affordable housing and for neighbourhoods that are inclusive and welcoming to ordinary people. This entry was posted in Culture, Uncategorized and tagged Culture, Fitzrovia, London. Bookmark the permalink.